As a certified Fleet Specialist on the Sunshine Coast, the Fleet team at Sunshine Toyota can confidently tailor a package to suit your fleet requirements. Whether you are a large organisation or a small family business, be assured that your needs being met is of great importance to us. Our Fleet professionals are on-hand to advise and assist you every step of the way to help you with your vehicle fleet management. 5493 3900 and ask for the Fleet Department, or click here to email us with your enquiry. With Toyota Fleet Management, our Fleet Specialists can take care of your fleet vehicles so you don't have to. With fully maintained financing that is tailored for small businesses, we offer two Fleet finance options, lease or buy through a Complete Lease or Maintained Chattel Mortgage. Talk to our Toyota Fleet Specialists about how Toyota Fleet Management can save your business time and money by managing your Fleets: Finance Costs, Insurance, Maintenance Costs, Roadside Assist, Tyres, Registration, CTP and Fuel Card (fuel usage is an additional charge). Having worked for over 18 years in the automotive sales industry, Scott brings a wealth of knowledge to his position at Sunshine Toyota. Apart from his 7 years experience as a Fleet Sales Manager, Scott has also held the position of New Vehicles Sales Manager both in Brisbane and on the Sunshine Coast. Also, the role of Light Commercial Specialist has provided Scott with extensive experience in outfitting vehicles for both tradespeople and councils. Scott moved to the Sunshine Coast over 10 years ago and loves the relaxed coastal lifestyle. Outside of work he is involved with coaching the Noosa Malibu Club Pee-Wees (under 12s) and is on the board of the Eumundi Dragons Junior Rugby Union Football Club. Scott has three children and is a proud supporter of the QLD Reds and the Wallabies. "I need to say a big shout out to Scott. He was absolutely fantastic. We run 3 plumbing businesses and he truly took the time we didn't have and the effort we also have very little of out of the transaction. He gave us a fantastic trade-in on what was a very average car and we really appreciated the negotiation process which I hate doing with a passion with "car salesman". It was actually pleasant... first for everything !!! So.... a huge thanks to him and the speedy time he arranged for this car to be ready for pickup on a Friday afternoon....I also need to make special mention about Scott going above and beyond the call in helping us get the trade-in vehicle to Sunshine Toyota. We needed to keep our boys working and also needed to be able to get someone to pick the new vehicle up without leaving another there, which was tricky. He again went above and beyond and arranged for himself to be dropped off by his wife in the morning by getting to our shed in Noosaville and he drove it down to Currimundi himself....What a truly great experience Sunshine Toyota - You have certainly won us over this time. Big thanks to Scott. I cannot thank him enough. You have definitely got a winning salesman on your team there who is absolutely instrumental to the success of your business at Sunshine Toyota. Keep him!!!" Moving to the Sunshine Coast from America 5 years ago with her husband, Kristen loves the Coast's offerings. Having grown up a runner, Kristen joins up with a few local running clubs road running and now more trail running and hoping to compete in the Blackall 100 km race in October. On weekends Kristen also enjoys surfing with her husband and training her two border collies at the local dog training club. No rivalries in the fleet office - Kristen too has been converted from gridiron football to Rugby Union and along with Scott is a proud supporter and season ticket holder for the QLD Reds and the Wallabies. Kristen has been at Sunshine Toyota for the past 3 years as the Delivery Manager, having an immense amount of fleet interaction with many fleet clients within the Delivery Manager role, Kristen has recently been rewarded with the opportunity to become a Fleet Specialist at Sunshine Toyota. 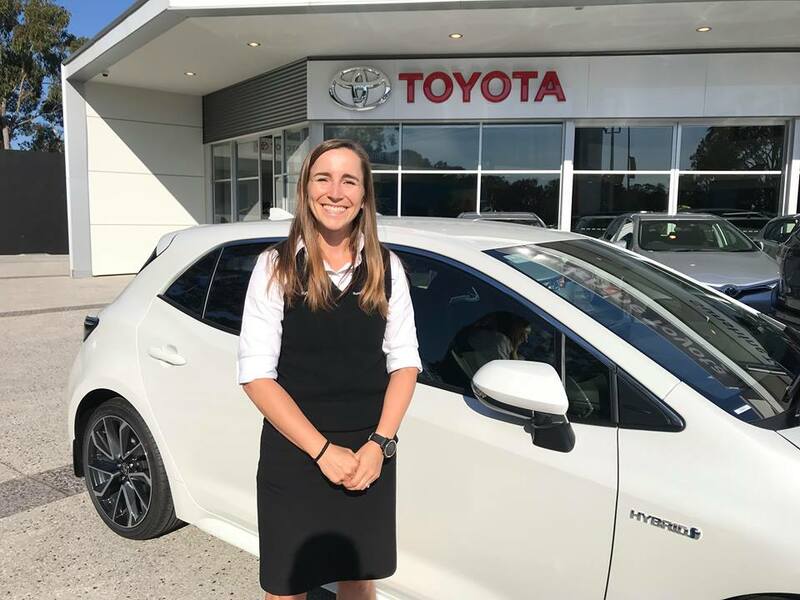 We are confident you will find Kristen to be a thorough, organised professional who genuinely loves the Toyota product (owns a LC70 Troopy) and a pleasure to do business with.